Every day there's more screaming about Goldman's trading operation. 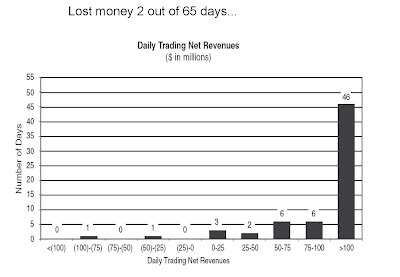 Though they deny using "flash" looks at the market, it is legitimate to be skeptical of a trading operation that has a "hit rate" (percent positive) of 97%....I won't specualte too much, but I WILL say that this is not an investment bank anymore, it's a hedge fund. And that's where the questions lie -->>should Goldman the hedge fund enjoy taxpayer support? And what are their earnings worth, in terms of a P/E? 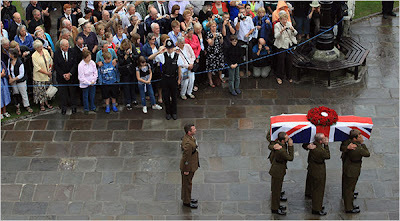 The Brits say goodbye to their oldest surviving WW1 veteran, Harry Patch. Everyone levered up, including Annie Leibovitz? "YRC's competitors say they aren't doing anything improper by taking advantage of a rival's weakness. What's more, they say their warnings that a capacity shortage could ensue should YRC exit the market are well-founded." In recent weeks, Estes, in a series of talking points distributed to its salespeople, has told them to send the message that "companies in trouble never give customers a heads-up that they are near the end," potentially leaving clients' freight stranded around the country. Within the past few months, FedEx has sent some YRC customers a pamphlet citing YRC's "significant work-force reductions" and suggesting these customers move their freight to FedEx "if you're concerned about potential service disruptions to your supply chain."